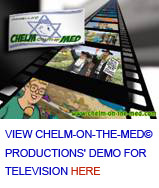 CHELM-ON-THE-MED© - INCREDIBLE SNIPPETS OF DAILY LIFE IN ISRAELCULLED FROM THE HEBREW PRESS is a book-length anthology of Chelm-like vignettes covering the years 1987-2007. Like this website, the stories range in length from 130-250 words and retell in English man-bite-dog stories and back-page news items that appeared in the Hebrew press – primarily Yediot Aharonot, written in a highly-stylized, fast-paced humorous form that uses plays on words, puns and zany use of English idioms. About 30 percent is published material that appeared in the author’s ‘Gleanings’ column and other published copy, 70 percent is unpublished material. The final draft of the manuscript was completed in December 2007 and is ready for review. Publishers and literary agents who would like to explore publication/representation, are invited to request the full MS and a detailed Book Proposal that discusses the book’s format, the genre, the market, a detailed marketing strategy and my credentials as a writer, and a full CV which outlines the author’s background in journalism, copywriting and a host of other ‘hats’.